NEW YORK (CBS) Six of jurors who sentenced Steven Hayes to death for the 2007 murders of Connecticut mother Jennifer Hawke-Petit and her two daughters, Michaela and Hayley Petit have spoken out for the first time since the sentencing. Jurors in New Haven Superior Court deliberated 17 hours over four days before unanimously voting to send Hayes to death row on Monday for his role in the deadly home invasion. 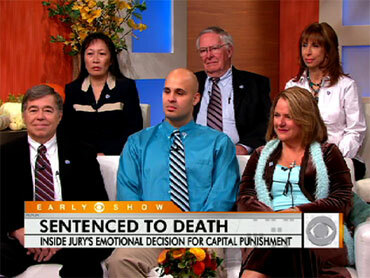 On Tuesday, CBS News "The Early Show" spoke with six of the jurors - Maico Cardona, Diane Keim, Herbert Gram, Paula Calzetta, Joel Zemke, and Jennifer Turner. They all reaffirmed their decision; each saying "yes" when asked if Hayes should die by lethal injection. Cardona described the deliberation process, saying the jurors wanted to hear the evidence and weigh everything properly. "We definitely took our time," Cardona told the morning show. "We wanted to make sure that we followed the laws of the state of Connecticut, and we followed the instructions that the judge gave us." Keim said it was a challenge for her and fellow jurors to keep their emotions in check. "I think that was a challenge for all of us..." Keim told the morning show. "We were given the task to work within - work in concert with the law, and in doing that, that's why it has taken us four days to make the decisions and reach a consensus." But in the end, they did agree, a decision that Dr. William Petit, the father and husband of the slain women, had hoped for. Petit spoke to the press after the sentence was delivered, saying that it was not about revenge. "Vengeance belongs to the Lord," Petit said. "This is about justice." Joshua Komisarjevsky, whom Hayes' lawyers attempted to paint as the mastermind of the home invasion, will be tried next year.